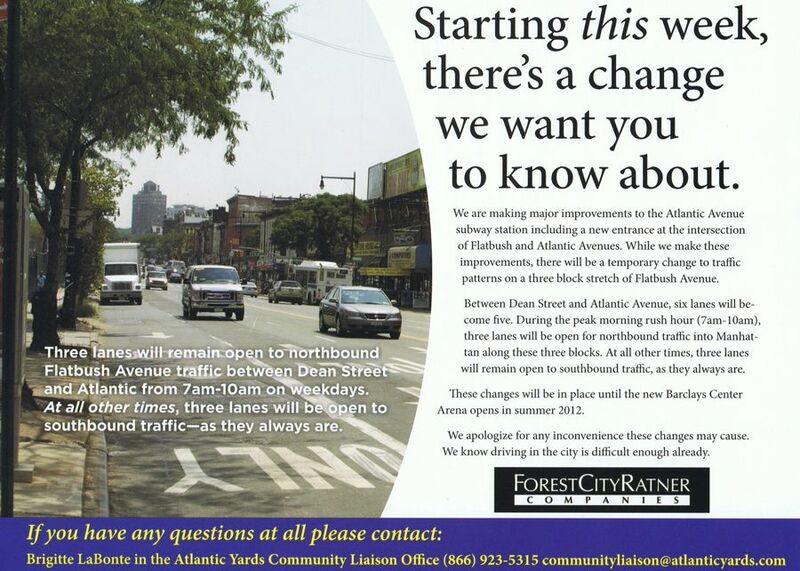 As traffic patterns change on Flatbush Avenue today, we should know that lanes will close for a lot longer than originally announced: at least five months. 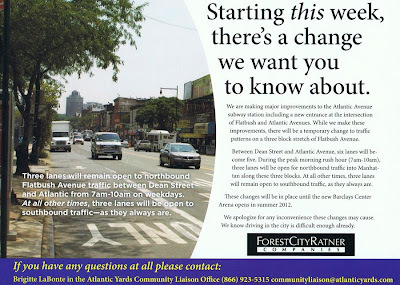 The "temporary" change in traffic pattern on Flatbush Avenue--six lanes becoming five between Dean Street and Atlantic Avenue--will not last from August 1 (as originally announced) or today (the revised plan) until "early 2012," as stated in both community notices embedded below. Summer 2012, not "early 2012"
It will last until "the new Barclays Center Arena opens in summer 2012." By no stretch of the imagination does summer come "early" in the year. I had been conservative in my earlier estimate of 17 months. Now it's 22 months to the beginning of the summer in late June 2012. But what if the arena opens in the late summer? What if it's delayed? If the trigger to reopen the lane is the arena opening, a delay in such an opening could mean that the "temporary" change in traffic pattern would linger until late 2012, or even 2013.